MH-60R Seahawk multi-mission helicopters are manufactured by Sikorsky Aircraft. Image courtesy of U.S. Navy, Photo by Mass Communication Specialist 2nd Class John Philip Wagner Jr. The first new-build MH-60R Seahawk was delivered to the US Navy in August 2005.Raul Moreno Jr. Image courtesy of U.S. Navy, Photo by Mass Communication Specialist 3rd Class Raul Moreno Jr. The MH-60R Seahawk is equipped with an energy-absorbing landing gear. Image courtesy of U.S. Navy, Photo by Chief Mass Communication Specialist John M. Hageman. MH-60R is powered by two T700-GE-401C engines. Image courtesy of U.S. Navy, Photo by Mass Communication Specialist 2nd Class Antonio P. Turretto Ramos. MH-60R multi-mission helicopter is also suitable for vertical replenishment missions. Image courtesy of U.S. Navy, Photo by Mass Communication Specialist 3rd Class James Vazquez. Sikorsky Aircraft developed the MH-60R Seahawk multi-mission naval helicopter, also called ‘Romeo’, in order to replace the US Navy’s legacy SH-60B and SH-60F helicopter fleet. The MH-60 R integrates advanced mission systems and sensors developed by Lockheed Martin Mission Systems and Training (MST). The helicopter is intended to carry out a range of missions, including anti-submarine warfare (ASW), anti-surface warfare (ASuW), surveillance, communications relay, search and rescue (SAR), naval gunfire support (NGFS), personnel transport, vertical replenishment (VERTREP) and logistics support. It can be launched from aircraft carriers, destroyers, cruise ships, frigates and amphibious ships. Remanufactured from a SH-60B, the first MH-60R helicopter made first flight in July 2001. The first two new-build MH-60Rs were delivered to the US Navy in August 2005. The first Helicopter Maritime Strike Squadron (HSM) 71 equipped with MH-60Rs was established by the US Navy at Naval Air Station (NAS) North Island, San Diego, in October 2007. The US Navy received the 200th MH-60R in November 2014. The MH-60R features a spacious cabin, which provides a comfortable operational environment for three to four flight crew and five passengers. The cabin is 3.2m-long, 1.3m-high and 1.8m-wide, and offers an area of 6m² and a volume of 8.5m³. "The US Navy received the 200th MH-60R in November 2014." The helicopter is equipped with digital, open-architecture, night vision-compatible all-glass Common Cockpit avionics suite from Lockheed Martin. The cockpit integrates four 8in x 10in full-colour flight and mission displays, ruggedised integrated military-off-the-shelf (MOTS) mission computers, full digital communications suite, mass memory data storage unit, and flight management computer and operations software. The cockpit is also fitted with a global positioning system, an inertial navigation system, satellite communication system and secure VHF / UHF communications. The MH-60R helicopter can be armed with Mk 54 lightweight torpedoes for ASW missions. It can carry a number of weapons, including eight Hellfire anti-surface missiles and .50 calibre guns for ASuW missions. The MH-60R Seahawk naval helicopter incorporates new Telephonics APS-147 multimode radar, which employs inverse synthetic aperture radar (ISAR) technique to perform imaging and periscope detection at short / long ranges. The rotorcraft utilises Raytheon-developed AN/AQS-22 airborne low frequency sonar (ALFS) subsystem for littoral and underwater warfare missions. The ALFS subsystem is integrated with a dipping sonar and sonobuoy processing capability. The Advanced ALQ-210 electronic support measures (ESM) system is also installed to detect, locate and identify threats. It is complemented by an ESM autoloader and the development of mission data loads. A second generation AAS-44 forward-looking infrared (FLIR) electro-optical (EO) system onboard the MH-60R provides increased surveillance of the battlefield during low light conditions. It also offers Hellfire targeting capability. The helicopter is integrated with a data link for data transmission, an ARC210 Gen 5 multi-function radio for flexible and secure communication, and chaff and flare decoys dispenser. It also features an integrated self defence system for protection against RF, IF, laser and missile threats. The MH-60R is tolerant against small-arms fire and medium-calibre high-explosive projectiles. Its airframe and energy-absorbing landing gear offer increased survivability in the battlefield. Other survivability features include dual-redundant flight control system, ballistic-hardened flight controls, a modular transmission system with fail safe lubrication, triple redundant hydraulics and electrical systems, and load-limiting crew seats. The tail rotor has redundant failsafe controls, while the main rotor blades are tolerant against 23mm rounds. The helicopter’s high-mass components are designed to retain within the frame in 20/20/10G crash conditions. The cockpit is fitted with jettisonable doors to provide an emergency exit. The spall-resistant windshield and cockpit structure offer enhanced protection for the occupants. The MH-60R Seahawk naval helicopter is powered by two T700-GE-401C engines, which generate a maximum take-off power of 2,554kW each. It is fitted with self-sealing fuel tanks of 2,230l storage capacity, and two external tanks. The helicopter has a maximum cruise speed of 267km/h and maximum take-off gross weight of 10,659kg. It can endure airborne for up to 2.7h when deployed in undersea warfare missions and up to 3.3 hours in surface warfare operations. It has a hovering out of ground effect (HOGE) ceiling of 4,525m and a hovering in ground effect (HIGE) ceiling of 4,525m. Lockheed Martin was awarded $360m worth of production and development contracts for the US Navy’s MH-60R fleet in January 2011. The Navy is anticipated to purchase a total of 291 MH-60R helicopters. Lockheed Martin also secured a five-year contract worth $1.05bn from the US Navy to deliver more than 200 digital cockpits and integrated mission systems and sensors for the US Navy’s MH-60R and MH-60S helicopters, in April 2012. 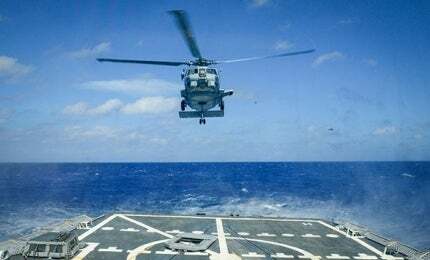 The SH-2G Super Seasprite, manufactured by Kaman Aerospace, was the US Navy’s front-line intermediate-weight helicopter. The Australian government signed a contract with the US in June 2011 for a fleet of 24 MH-60R Romeo helicopters to support the Royal Australian Navy’s anti-submarine and anti-surface warfare operations. The first two helicopters were accepted by the Royal Australian Navy in December 2013 followed by another two in February 2014. Deliveries of all 24 MH-60Rs are scheduled for completion by 2016. The government of Qatar requested the sale of six MH-60R Seahawk helicopters along with 13 T-700 GE 401C engines, support equipment and logistics support services in September 2011. The Republic of Korea requested the sale of eight MH-60Rs, 18 T-700 GE 401C engines and support equipment, as well as logistics support services in May 2012. In December 2012, the Danish Government signed a letter of offer and acceptance with the US Navy for the purchase of nine MH-60R helicopters and logistics support. Deliveries are scheduled for completion by 2018. In March 2014, Maritime Helicopter Support Company (MHSCo), a joint venture of Sikorsky and Lockheed Martin, began construction of the maintenance and warehouse facilities to deliver through life support logistics services for the Royal Australian Navy’s fleet of MH-60R helicopters.